9:00 am Full band practice – Eat a healthy breakfast before you come!! 5:20 pm Pack up and change out of uniform make sure to have weather appropriate clothes. 5:45 pm Watch Rockford as a group in back bleachers. 6:30 pm Eat dinner Bring food or $ for dinner. 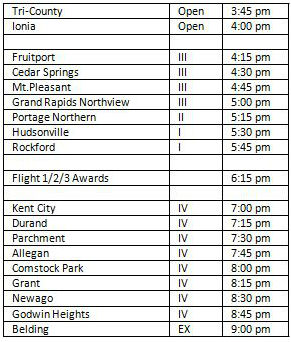 6:45 pm Watch flight IV bands –we will NOT stay for their awards to beat the crowd out. Do NOT get on the bus to come home until your captain is on the bus! You may leave with your parents after our performance IF you give a signed note to your bus captain. Concessions are available for your convenience AFTER WE PERFORM and are out of uniform! Head east on Plainfield Ave, a slight left onto MI-44/Northland Dr for 2.7 miles. Turn right on Belding road/MI-44 continue for 17 miles. Turn left on Hall street.